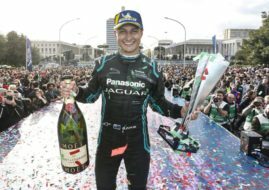 Jaguar Formula E Team has signed Nelson Piquet Jr., the winner of the inaugural FIA Formula E Championship in 2015, to drive for the team in the next 2017/2018 season which will start in Hong Kong in December. In its second Formula E season, the team will retain Mitch Evans as second full-time driver while Ho-Pin Tung will serve as reserve driver. Both Jaguar and Nelson Piquet Jr have tough season behind. The British team finished last among ten teams in the 2016/2017 Formula E Championship, scoring no podiums. The best result for Mitch Evans was fourth place in Mexico while Adam Carroll was 8th place in the same race. On the other side, Nelson Piquet Jr triumphed in the inaugural Formula E season with NextEV team but after that he failed to reach podium in twenty-two races, finishing 15th in the second season and 11th in recent season. “Jaguar has such a strong history in motorsport and it’s an exciting time to become part of the team. Their commitment to electric motorsport is inspiring and I’m looking forward to working with the team,” Piquet said.